Facts and history about the life and lifestyles of Native American Indians. Many Native American Games and sports were designed to prepare for hunting and for war. But the people also enjoyed leisure activities such as story-telling, feasting, music, songs, dancing, gambling games and athletic contests. It was important for the men of the tribes to remain fit and many of their games, such as chunkee, included hard running and endurance. These games included stickball, an early form of lacrosse, in which the ball was caught with a netted ball stick. Other Native American games included foot races, canoe races, tug of war and numerous types of target games. The life, history and lifestyle of Native American Indians is a varied and fascinating subject. The following fact sheet contains interesting facts and information on Native American Games. Native American Games Fact 2: Games varied according to the locations of the tribes and their lifestyles. The geography and resources of a particular region determined the type of equipment used in the games, and the kind of games and sports that were played. Native American Games Fact 3: Achievements and athletic skills were greatly admired and the 'sports stars' of the tribes were given a high status. The best players held a traditional place of honor in the tribal communities. Native American Games Fact 13: Counting Coup played an extremely important part in the life of a Great Plains warrior. The above picture depicts American Indians striking the coup post during practise sessions. 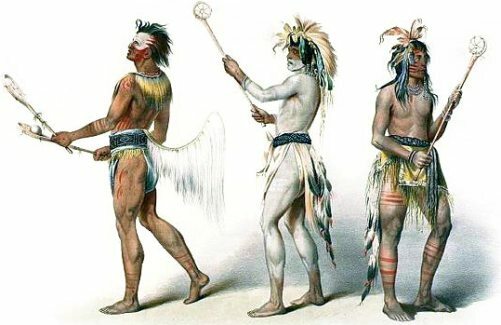 Native American Games Fact 15: Relay races were played in teams passing a willow stick from one participant to another. The two sides raced back and forth until a team went so far ahead that the other team could not catch up. individual running races were another great favorite. Some race tracks stretched for three miles, which were run over three times. Native American Games Fact 19: The Pima tribe of the Southwest, Pacific Coast tribes such the Haida and the Arctic Inuit tribe enjoyed Stick-Catching games, similar to juggling, requiring balance and coordination. Native American Games Fact 22: Ring and Pin was a game played by women and older children and involved tying a pointed stick (pin) to a piece of sinew that was attached at the other end to a ring. The objective of the game was to swing the stick so it went through the ring. This particular game was taken very seriously by the women of the Cheyenne tribe who often wagered high stakes on the outcome.